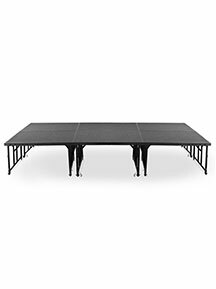 Portable stages and risers provide you with the perfect solution for concerts, assemblies, theater productions, worship services, and choral performances. Portable Choral Standing Risers are easy to set up, allowing for quick arrangement to meet your needs. Our Single Height Portable Stage is strong and stable. This product is outfitted with ganging to easily connect multiple stages. Our Transfix Stages are a lightweight, portable solution. Available in both hardboard and a variety of carpeted surfaces. 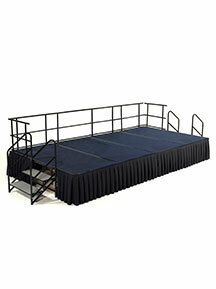 Strong and stable, yet easy to move and set up, our stages and risers serve your performance needs. Some models feature ganging to connect multiple stages together. 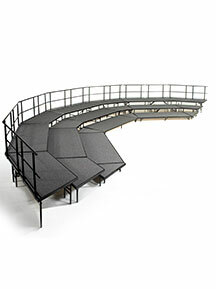 Optional side guard rails provide extra safety, and our Transfix Stage is available in hardboard or carpeted surface. Shop now to find the equipment you need.